January 17, 2018 January 17, 2018 - by benign0 - 7 Comments. The game is up for Maria Ressa. As CEO of embattled “social news network” Rappler, she should have been on top of her company’s risk exposure to the business environment — including the regulatory framework in the country within which her business operates. She and her cheering squad used the argument that the Securities and Exchange Commission (SEC) is penalising her for something that they could have cited over the last several years Rappler has been in operation. But the fact that the regulation Rappler is being penalised for — accepting foreign funding — was not invoked in previous years does not make that compliance risk go away. Maria Ressa is, in short, solely at fault for the troubles Rappler suffers today. But rather than take accountability for her executive lapse in judgement, Ressa has instead chosen the path of, wasting even more of Filipinos’ time and attention span. As I had written some time ago, the Philippine Opposition already suffers from a glaring lack of strategic direction thanks to all the rabbit holes the screeching lot of the Liberal Party stalwarts that presume to lead it have led it down. The whole notion that “fighting for Rappler” equates to “fighting for press freedom” is another such rabbit hole the Opposition have stuck their pointed heads into thanks to their Yellowtard leaders. To begin with, Rappler is no different to the other big corporate media organisations that make up the inbred oligopoly that is the Philippines’ media industry. It is no more “independent” of the influence of the powers-that-be than any of the others. The way certain “activists” are fashioning Rappler into God’s Gift to Philippine Press Freedom, it is as if this “freedom” all emanates from Maria Ressa. This is evidence that Yellowtard “activists” don’t actually understand the real essence of free speech. The truth is, no one person or media entity is truly “unbiased”. Everyone has a bias — even (shockingly) Maria Ressa herself! It takes a vibrant ecosystem of biased people articulating, exchanging, and, most important of all, debating views for a “free market of ideas” to produce a balanced collective thesis. In plain English, this is just the old turn-of-the-century vintage principle of “wisdom of the crowds” (or, going even further back to the mid-1980s political jargon, the so-called “will of the people”). It is on this principle that the idea that “democracy” progressively yields the best results for the majority is founded. The Darwinian dynamic of said “free market of ideas” kills weak ideas and propagates strong ideas. Or so the thinking goes. Whether or not this “free market of ideas” system actually yields good results for the majority has become debatable. But the fact that it may or may not does not mean that a monopoly on truth is a better situation to have. And herein lies the irony that sails way above the pointed heads of the screeching Philippine Opposition. By putting Rappler and its czarina Maria Ressa up as a single rallying point for a so-called “fight” for “press freedom”, these bozos are suggesting that Rappler — and Ressa — hold a monopoly on truth. Perhaps this is the reason Ressa had exhibited the sort of recklessness and impunity that she is now being punished for — because such an idea, through the sheer pounding of her own cheerleaders, got so deeply-embedded in her own pointed head that she had lost all sight of her role as the most accountable person in her organisation. Rather than externalising Rappler‘s problems as an issue of “press freedom”, Ressa should woman-up and acknowledge that she is responsible for failing to mitigate the compliance risk she sat on for years that led to the debacle she and her organisation is in the midst of today. Ultimately, Rappler‘s problem is internal in nature. The organisation suffers from the internal problem of being led by a CEO who has utterly failed to do her job. And that is the truth Filipinos should be fighting for. Indeed, Filipinos have long been criticised as a people who never take personal accountability for failure. Rather than correct that detestable cultural character, Ressa is proving to be a model of that dysfunctional way of thinking. Rather than celebrate Ressa for being an exemplar of “truth” she should be put up as a model of what not to be. And that is the TRUTH. Seems the “opposition” is basing their idea that they must be free to operate as a business and receive money from funders who have the reputation of funding attempts to overthrow governments in other countries. But indeed, you don’t need to be a business to oppose the government (and you don’t need to oppose the government to criticize it). Problem is, it seems the guys are not opposing for a just cause, but for some money. Perhaps one should take note that the real threat to press and expression freedom in the Philippines is that most mass media is owned by politicians and politically-aligned businessmen. This report by Reporters without Borders says it. The problem from this is that these politically manipulated media companies will claim to represent the people’s opinion, but actually represent their own. When a real independent citizen will want to air a differing opinion, the media or someone associated will either try to shut him up or ruin him, even when the individual is airing on their own channel (like a blog). Individual expression is suppressed this way. Lost in the whole caboodle is the fact that Rappler is a business enterprise. And business is an entirely different field requiring an entirely different skill set. Ressa is a journalist, not a businesswoman. She has to learn it the hard way that running a business, let alone make it successful, is not really a walk in the park even with abounding capital. LP yellowtards/PH activists and their mouthpiece to the international community have mastered the art ofLogical fallacies without even knowing it. Filipinos should learn these fallacies as early as Grade-3 rather than wait till they’re in College for their Philosophy 1 class. Smarter Filipinos will lead to fewer duped warm bodies for logic-devoid street activism in the country. 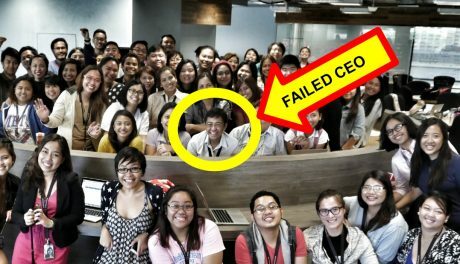 Rappler should get a real CEO, a real business model, and a genuine/noble cause if it wants to survive. Maybe selling lugaw with Leni to fund their reporters could be a start. In the meantime, enjoy your “Freedom from Rappler” parties everyone. The entire nation is in jubilation like it was EDSA 1 all over again. Rappler.com is a business. If a business, is mismanaged, bankruptcy is for sure. Unfortunately, Maria Reesa refuses to accept the responsibility of her failure. Her company is going bankrupt, that she has to accept foreign financiers. She violated the law. So, they have to close her company. Ms. Maria Reesa, please understand that you cannot save your company from being closed by pointing at “Press Freedom”. The closure of your company is farthest from the “Press Freedom” issue. Besides, people have already awaken. It is no longer the Aquino Cojuangco era; it is already the Duterte era. Grow up, Ms. Maria Reesa ! You got indoctrinated millennial college students as their work force, they really love the idea of the “One World, Everyone is a Citizen” notion, why they follow the same tactics like the thousands of liberal left-leaning media in the West, because if everyone is spouting the same thing, it’s truth and everyone who counters them are the “minority” or “wrong-thinking enemies”, they are as naive and pathetic as the current crop of champagne socialists I see in Manila, spouting liberal crap while barely doing enough to build the nation, well they notion of being part of a nation seems to be gone, everyone is an Global Citizen with the values only allowed is being a politically correct idiot, this is the Modern Left, self-destructive, naive, delusional, and self-important. To also put things in perspective, the same western liberal media that is defending Rappler has little to no coverage on the Dengvaxia scandal , only skim-reading articles like “Philippines Stop Dengue Vaccination Program”, and no on-scene coverage or investigation on the scandal nor updates on the death toll of children, that should show you how “diligent and honest” these foreign media that are owned by corporations and have connections to the same political ideologues that they all share, it’s no wonder they come and protect each other or create a narrative that each of these members of the Propaganda Cabal report, they priorities stories that have political ramifications and how they and their allies can profit from it, while everything that is bad is given a footnote. The cult of personality has the power to subsume ideas, to make the person, the personality into the product and not the work itself.